Music Week has obtained a letter issued by Warner Music Group that reveals a starkly different approach between the majors in how the proceeds from the equity sale in Spotify will be passed on to artists. Warner Music Group has now cashed in its entire Spotify holding (a 1.9% stake), with an estimated $126 million (£98m) set to be passed on to artists from a total of $504m (£391.9m). But the major has now revealed that it will be treated as a payment on account, meaning that the ‘windfall’ will favour a minority of successful artists rather than those who have yet to fully recoup on an advance. For some artists, that Spotify-related credit would mean they technically owe WMG less money and it could ultimately help push them into the black. But for others, the proceeds passed on by WMG would simply end up back with the major as part of the recoupment. The letter obtained by Music Week said: “In February 2016, we were the first major music group to announce a policy to share the proceeds from the sale of our equity in streaming services. Between April and June 2018, we received about $500m in proceeds from the sale of all the equity issued by Spotify to our recorded music business prior to Spotify’s launch in October 2008. Warner Music and Sony Music Entertainment confirmed two years ago plans to share any revenues from the sale of Spotify shares with artists, though it’s now clear the terms of that arrangement differ considerably. Universal Music Group only recently confirmed it will also share proceeds from the sale of equity, but it has so far opted not to sell any shares - a move that could be seen either as a public show of faith in the streaming giant or a potential sweetener for a buyer of the 50% of the company on sale by Vivendi. While Warner Music Group has opted to treat the payments as an account credit, artist-friendly Rob Stringer’s Sony Music Entertainment has made the windfall from its 50% sale of stock a one-off payment that won’t be counted against unrecouped balances. As a result, all artists will get a share of the proceeds - a move that one executive described as “doing the right thing”. At 5.7%, Sony had the biggest holding in Spotify out of all the majors and has now begun to distribute the $750m (£583.3m) profit it collected from the sale of 50% of its holding in April. Sony Music Entertainment’s Spotify cheques, which will be calculated as a percentage of revenue for recipients between 2008 and 2018, have started going out to artists and distributed labels. The letter from Sony, which first emerged in June, reveals a formula based on an equal split between the major’s overall revenue and its Spotify revenue over the last decade as the early licensing deals were based on past performance. It means even acts who have not performed strongly on the streaming platform will benefit from a payment reflecting Sony’s overall growth in that period. 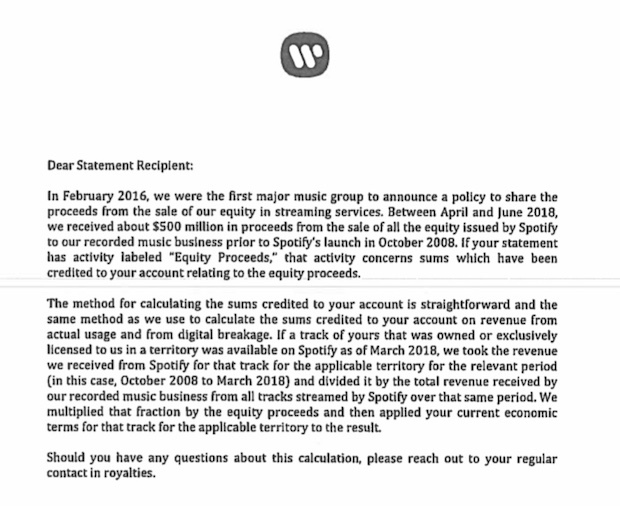 The revelation about WMG’s approach to artist payments comes on top of CEO Steve Cooper’s announcement during an earnings call in May that distributed labels would receive a Spotify payment from the equity proceeds if “included in their agreements with us”. There’s now speculation about just how many labels would have had such an agreement in place in order to secure a share of that Spotify windfall. Sony Music Entertainment’s approach to distributed labels is calculated on a similar basis to its payment formula for artists. Universal Music Group still holds a 3.5% share of Spotify, though it remains to be seen how artists and distributed labels fare in any eventual payout. As exclusively revealed by Music Week, Merlin has already passed on payments from its Spotify sale to members.